Wine Down Wednesday - Join Us For a Great Night at Grain & Cane! Name: Wine Down Wednesday - Join Us For a Great Night at Grain & Cane! Business After Hours networking in a relaxed atmosphere. 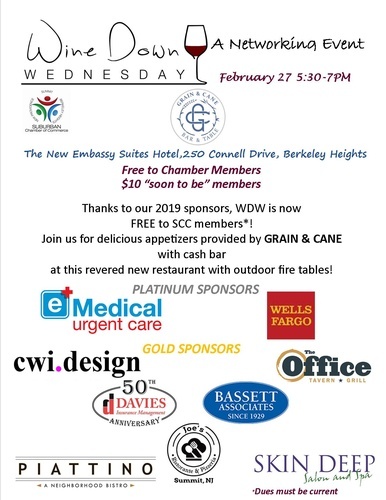 This month GRAIN & CANE at the newly opened Embassy Suites Hotel in the Connell Park, Berkeley Heights, will host- this exciting new restaurant is a NOT TO MISS evening! !